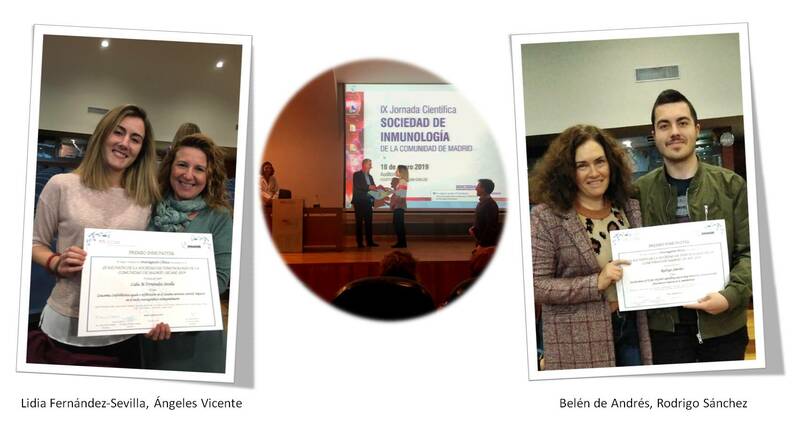 The INMUNOTEK awards have been granted to the winners during the closing ceremony of the 9th Scientific Meeting of the SICAM (Society of Immunology of the Community of Madrid) held at the Hospital Clínico San Carlos in Madrid. The awarded presentations have been selected among those presented at the Conference by a jury formed by four members of the Board of Directors of SICAM together with a representative of INMUNOTEK. Each of these awards are endowed with 1,500 euros in the categories of Clinical Research and Basic Research. The INMUNOTEK Prices aim to support the participation of research groups in the SICAM Scientific Conferences and to encourage young scientists to present their research to acknowledge their work. The awards ceremony was chaired by Dr. Silvia Sánchez-Ramón (President of SICAM) and Prof. Eduardo Martinez-Naves (Vice President of SICAM). The prize-giving was attended by Dr. José Luis Subiza, President of INMUNOTEK.